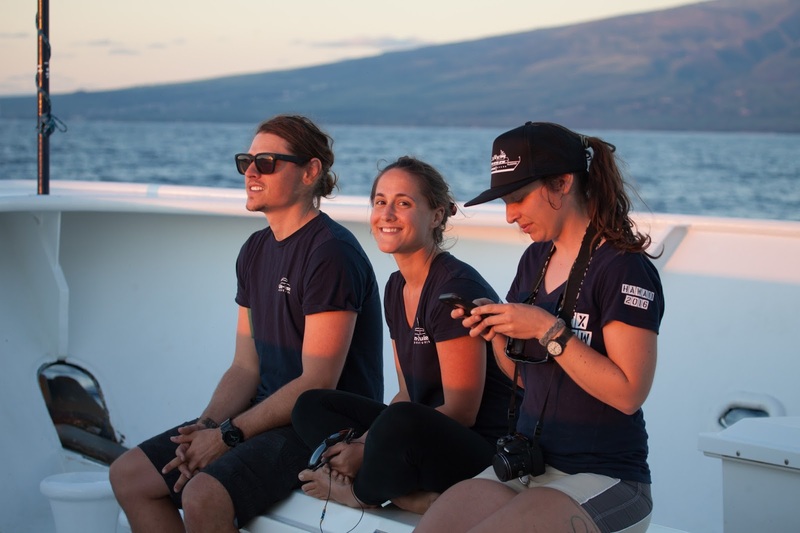 It has been a heck of a ride running as Expedition Leader aboard the UnCruise vessel Safari Explorer on their Hawaiian Islands adventure cruise these past four years. I have been able to work with some wonderful people, meet some amazing locals, and give so many guests the trip of a lifetime. 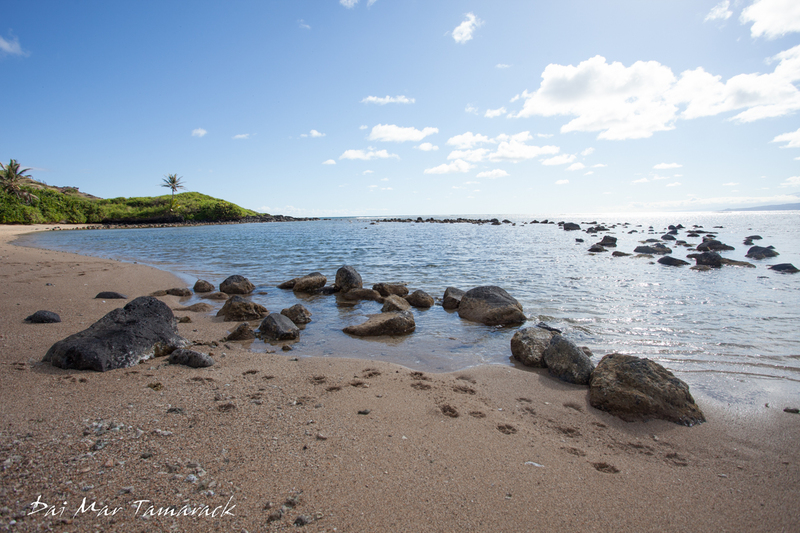 I have been able to see new wildlife that I had never seen before, and I was able to finally step foot onto the island of Molokai, and experience the 'Friendly Isle' at its best. 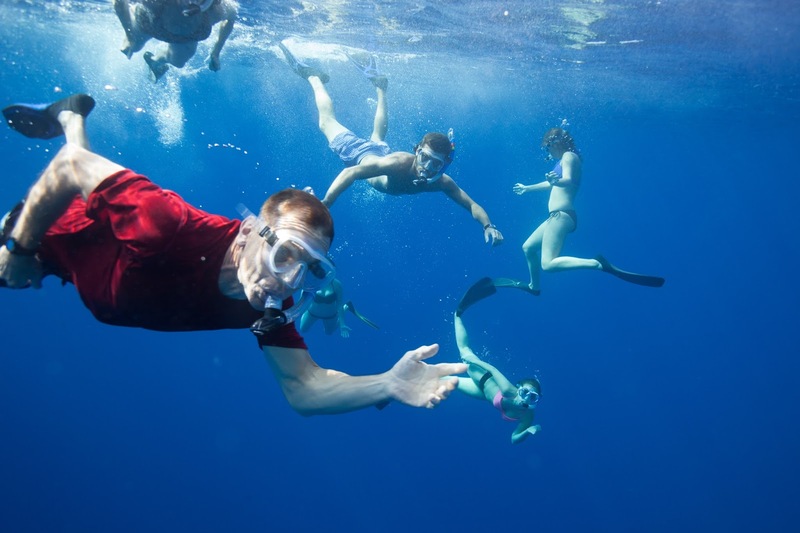 The trips are seven days filled with snorkeling, whale watching, kayaking, hiking, cultural immersions, wining and dining (for the guests), and educational presentations. 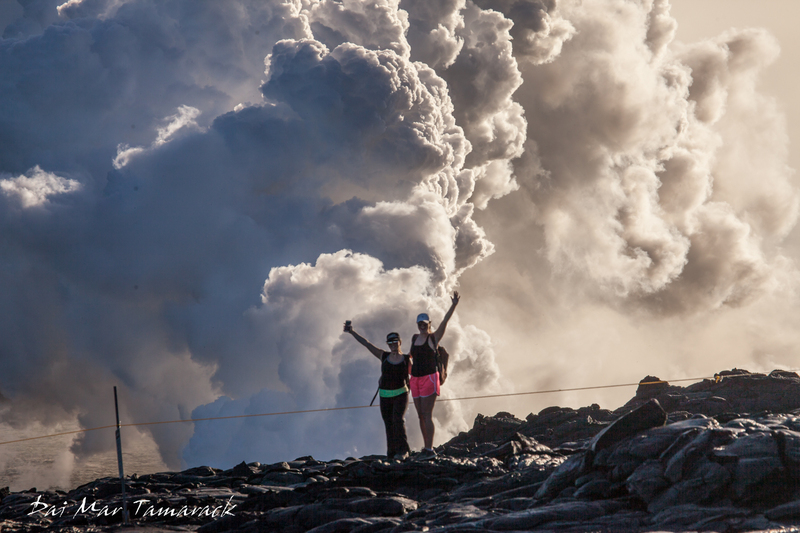 It is truly adventure luxury at its finest and a very unique way to see the Hawaiian Islands. 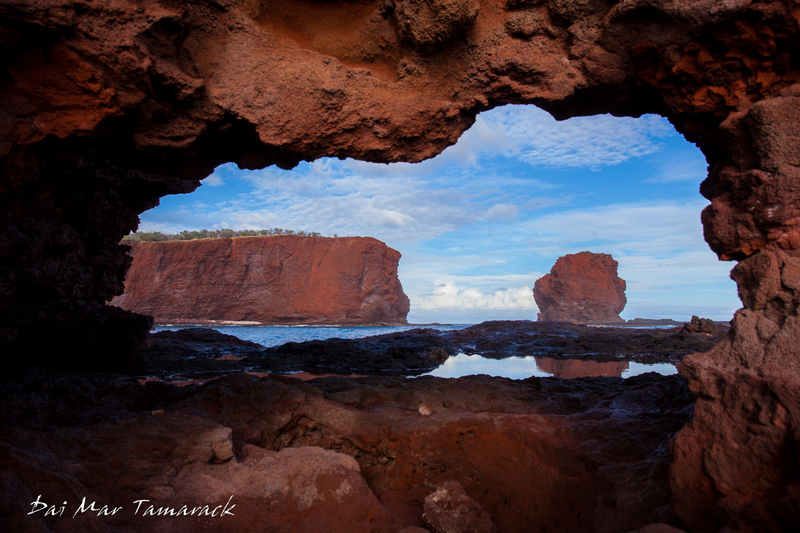 Not many people ever get to the islands of Lanai and Molokai. We would do both every week. We would also cross the infamous Alenuihaha Channel every week. While it is no Drake Passage or Cape Horn, there is a reason no one else does this crossing with any regularity. Breaching humpback whales, bowriding dolphins, nighttime manta rays, and swimming with sea turtles was the norm. 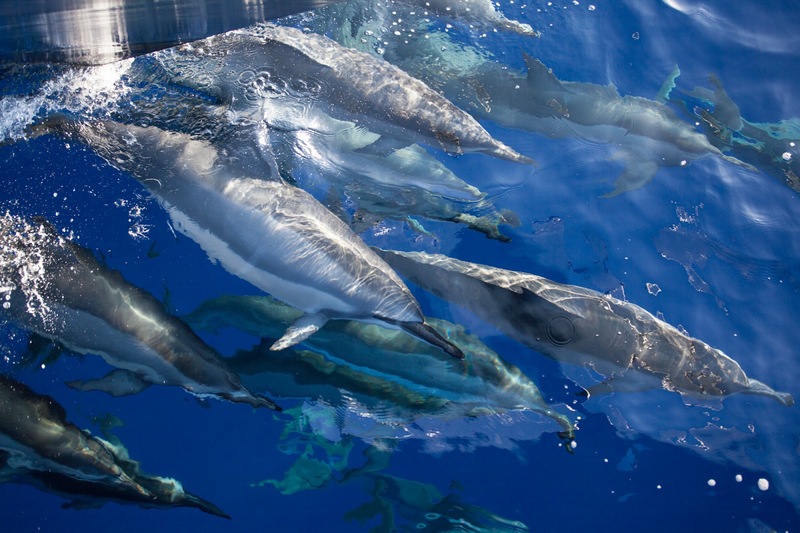 Beaked whales, whale sharks, roughtooth dolphins, pilot whales, false killer whales, pygmy killer whales, oceanic white tip sharks, hammerhead sharks, monk seals, and black footed albatross were some of the rarities. There are too many highlights to write down but here are a few that come to mind. Swimming with 40 hammerheads, pilot whales, oceanic white tips, and an albatross with Captain Zodiac adventures. Also letting our blind passenger drive the zodiac with Mitch and Collin at top speed an a flat calm day offshore Kona. Seeing an aerial collision of two humpback whales who were fighting over a female. The Dillon Family Christmas trip pictured above. Skurfing pre whale season, jumping off the top deck, Molokai Pizza parties, a New Years Eve beer, levitating out of my bunk crossing the Alenuihaha, stealthy surf sessions to Honolua Bay, cruising the 3000ft sea cliffs on Molokai's North shore, the list of baby names, the whale shark birthday drawing, crew Movie nights, seeing my baby in Lahaina, and making the trip seem smooth when the boat was not there....twice. I don't know how many fish presentations, photography talks, whale presentations, star talks, shark talks, next adventures, and slideshows I did but it felt great giving them. It seemed like I was able to make the experience a little more immersive for many of the guests. 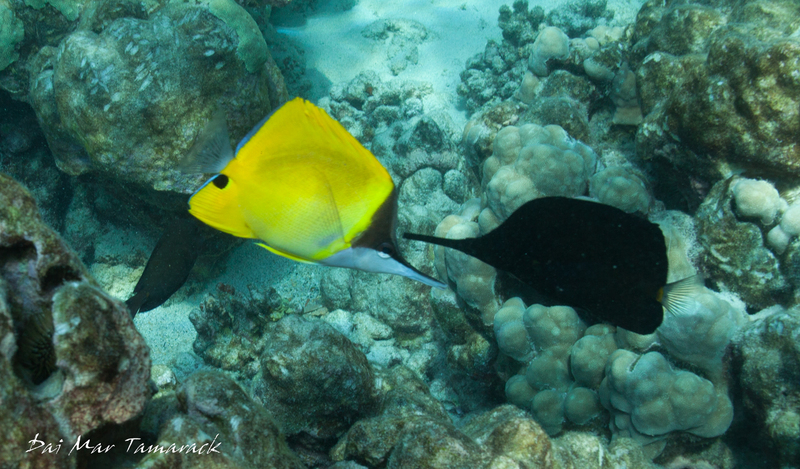 I mean who else would get them as excited about seeing the lauwiliwilinukunukuoi'oi'ele'ele....or the black longnose butterflyfish? Every year the crew that I was privileged to work with would blow me away with how professional and genuine they are. I could look at pictures of crew from each year and think about fun experiences with every single person. While I am pretty bummed that I am not planning on going back to the Safari Explorer next winter, it will always hold a dear place in my heart. Thanks for all the wonderful memories everyone! the traditional blowing of the Pu. All but 2.5% of the black footed albatross (Phoebastria nigripes) population resides in the Northwest Hawaiian Islands. Every once in a while we spot them flying offshore. They are immediately recognizable with their 7.2ft wingspan. I had spotted a couple over the last two weeks but I was very surprised to see one resting on the water. I was even more surprised at what happened next. I slipped on my snorkel gear and grabbed my little olympus tough camera and entered the water. The albatross seemed to be just as interested in me as I was in it. At one point it tried to peck the camera in my hand. I was glad to have a snorkel mask on covering my eyes. This bird was huge! And so beautiful close up. I spent about five minutes in the water with the albatross looking right back at me. This is a moment that I imagine few people have ever had. 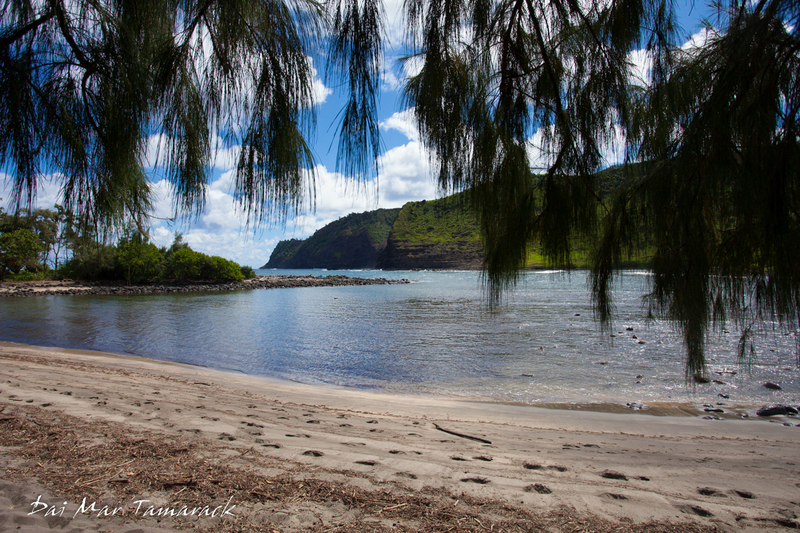 Molokai is known as the Friendly Isle, and for its large population of native Hawaiians. It is a place of no chain restaurants, high rises, or stop lights. 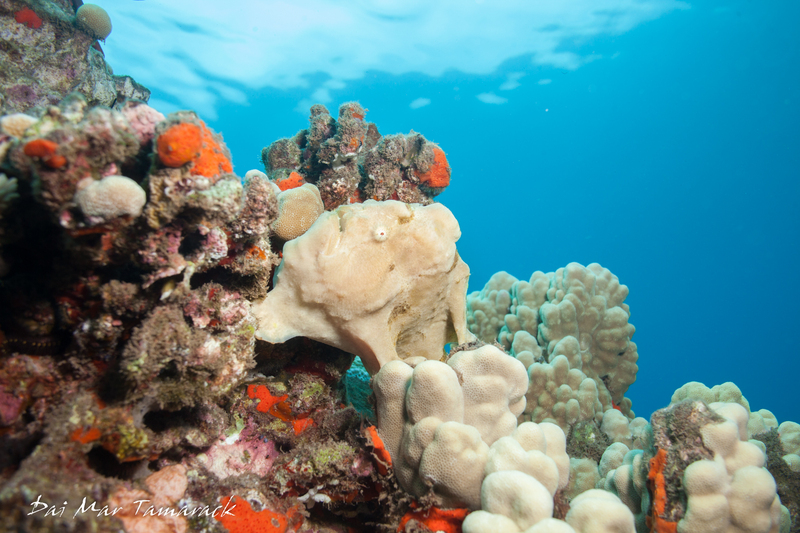 Ancient fish ponds dot the coastline, tucked in behind the largest barrier reef in Hawaii. 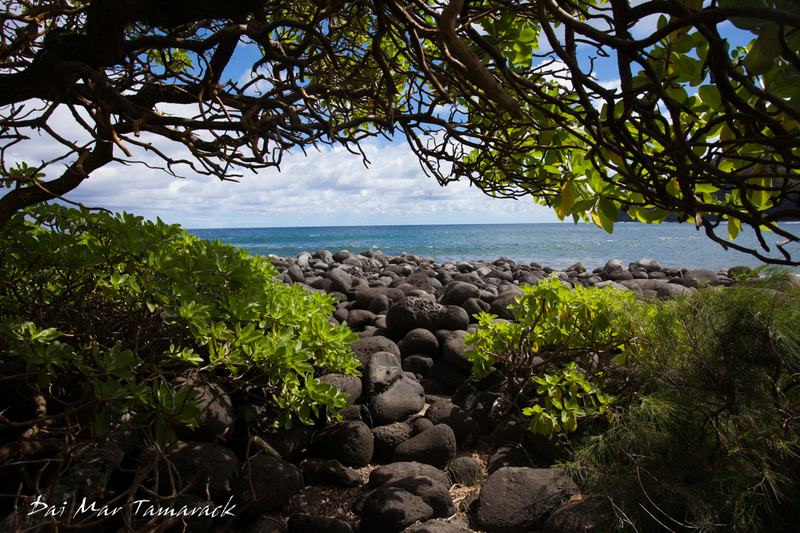 If one follows the state highway until it dead ends at the Northeast corner of the island you will find a hidden world of ancient Hawaii hiding away from the hustle of the rest of the state. 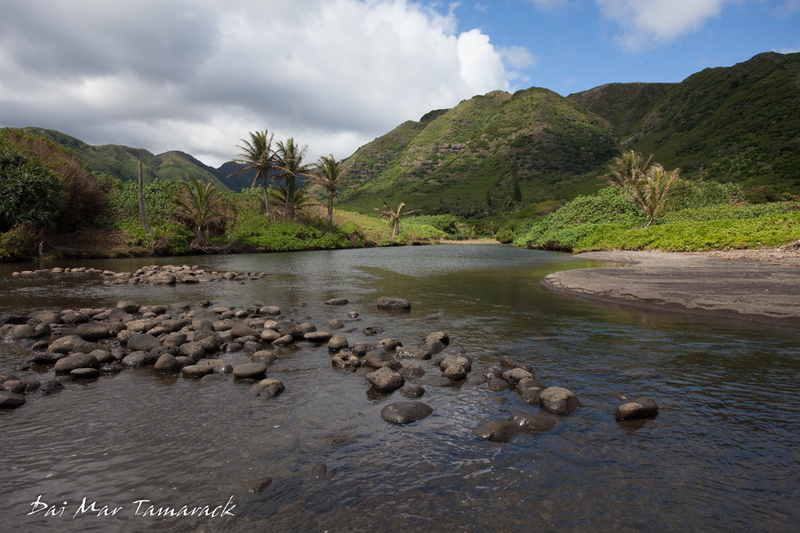 This hidden gem is called Halawa Valley. 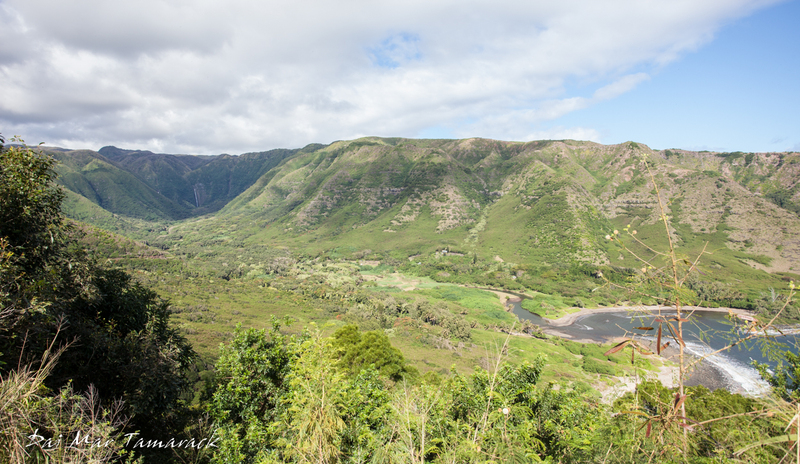 Halawa Valley is blessed with copious rain, a protected bay, an idyllic stream, and up to nine waterfalls cascading down the back of the valley. The valley was once a bustling farming community, but this all changed when a tsunami washed 1.7 miles up the valley on April 1st, 1946. It is moving hearing the story of that fateful day from someone who was there, watching and listening to the destruction from the hillside. Philip Solitario is the oldest living descendent born and raised in the valley who is still living in the valley. Tears well up in his eyes as he recounts that story, but it is only one of many stories that he holds and shares about this valley that his family has called home for 50 generations. Today Philip, who everyone refers to as Uncle Polipo or simply "Pops", is the cultural practitioner of the valley. 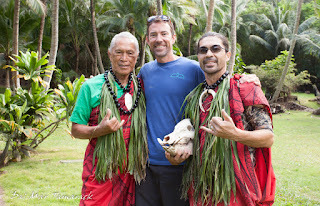 He and his son Greg teach visitors and Hawaiians alike the ways of their anscestors. 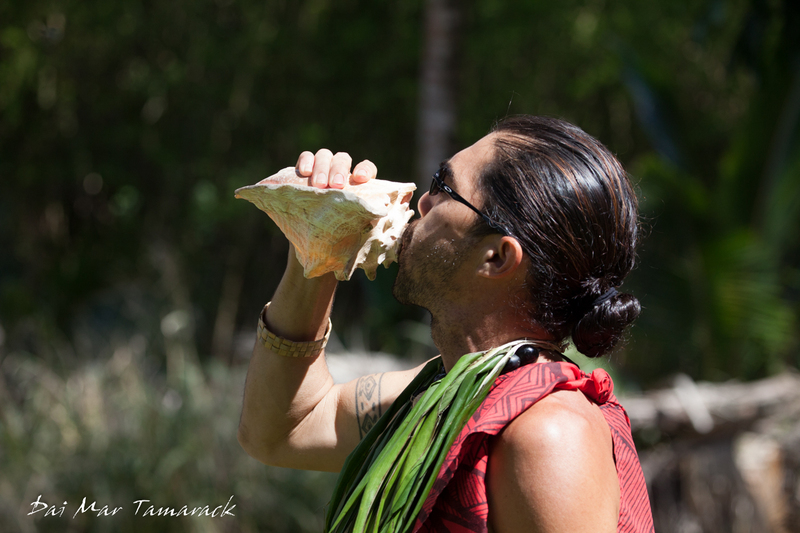 Switching out modern day cell phones for traditional 'shell'-phones, Uncle Polipo and Greg blow the Pu, or conch to begin the ancient protocol of asking permission to enter the valley. The sound of the shell echoes off the steep walls of the valley and immediately takes you back to a time long past. 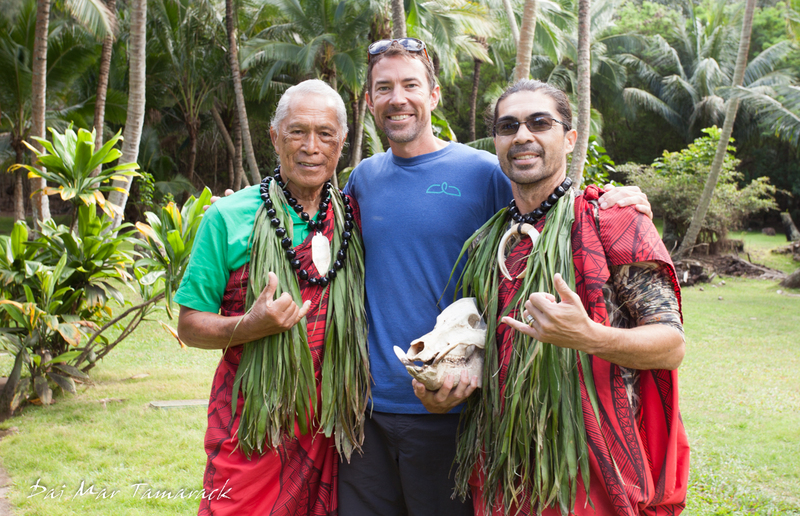 After the Oli chant and giving of gifts, we all participate in the traditional Hawaiian greeting called the 'Honi.' It means 'to kiss' in Hawaiian but it involves no lips. 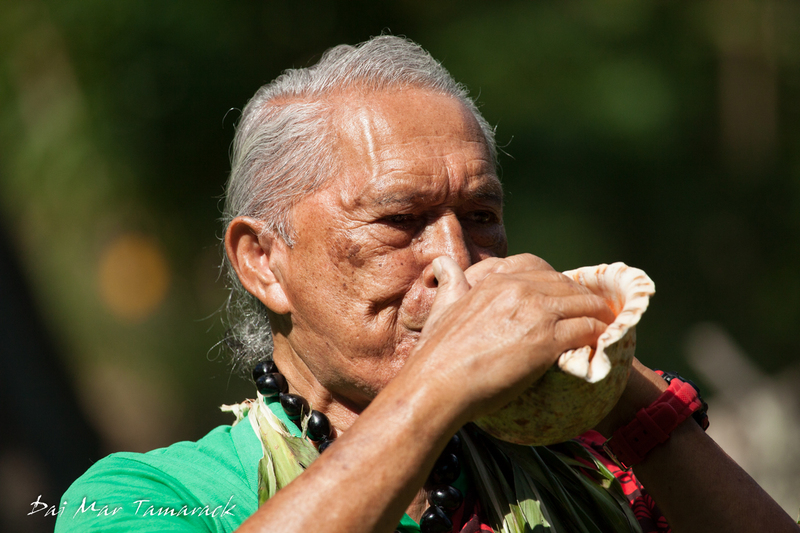 The honi is done by pressing your forehead and nose together and breathing in. 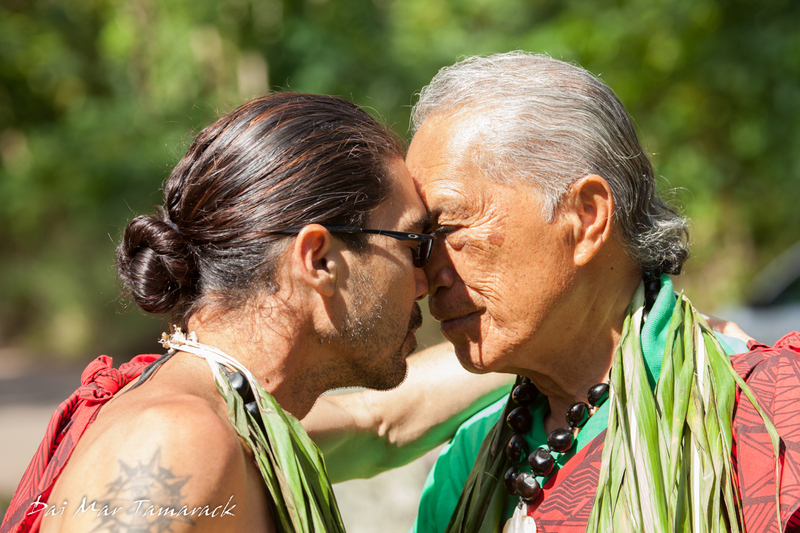 Through this process it is believed that you share "Ha", the breath of life and are no longer strangers. I've learned a great many things from Pops and Greg that transcend all cultures and religions. 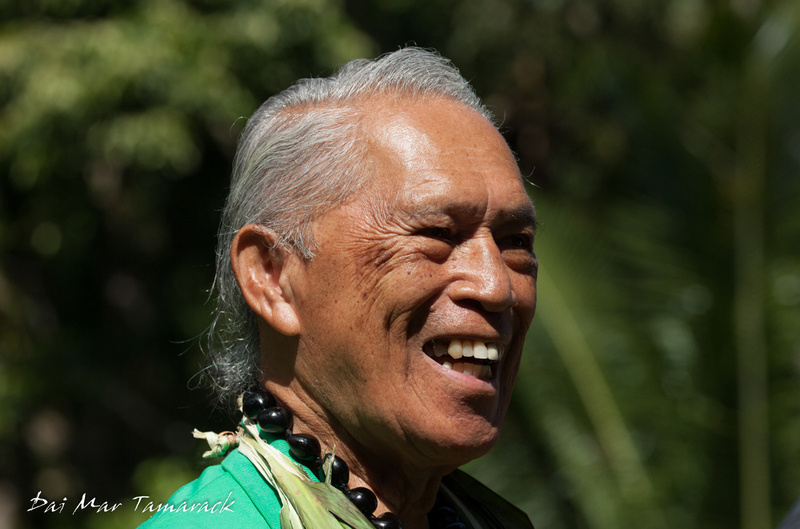 One of these lessons is known in Hawaiian as 'Nana ike Kumu.' This means 'Go to the Source.' 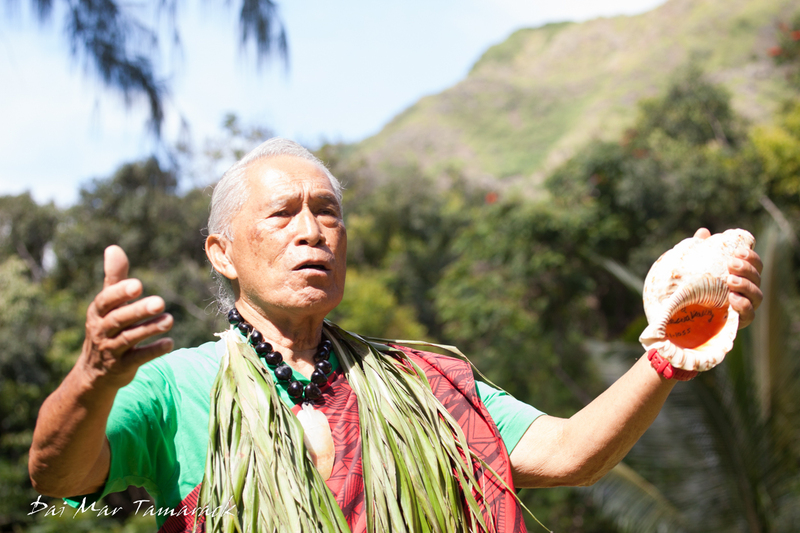 In Halawa valley this means learning about your history and where you come from by learning from your elders...not books written by outsiders. Elders are their most prized possessions for the knowledge they hold. Luckily Greg believe firmly in this and made the decision to move back to the valley from Oahu to continue the legacy and learn all he can from his dad before he is gone. 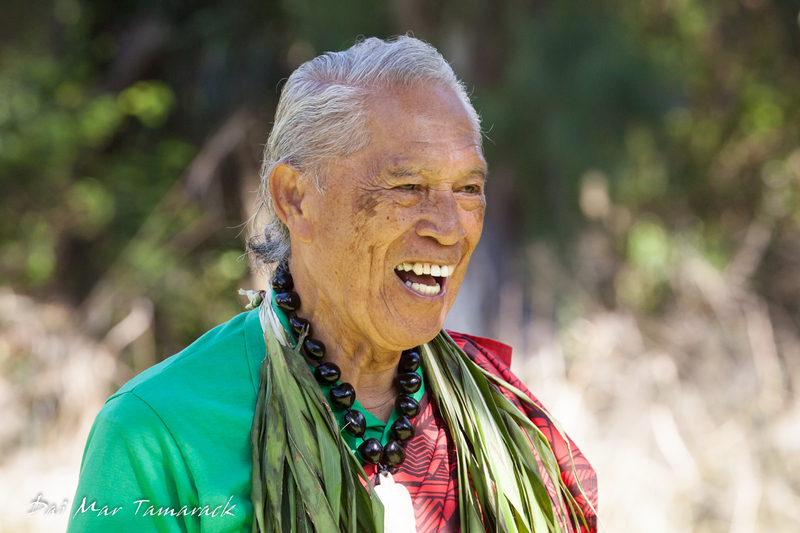 The Solitario family believes the Hawaiian culture should be sacred, not secret, which is quite lucky for us who want to soak up and learn more about the real Hawaii. It has been amazing visiting this beautiful place over the last four years. I have grown close to Pops and Greg and hope I continue to see them thrive in the future. I really admire what they are doing and have been glad to expose so many people to this through these UnCruise Hawaii trips. The mantas that frequent the Kona coastline have been not so frequent of late. In fact we've been getting skunked way more than normal this past year. So it was very refreshing to have multiple mantas back at the campfire for the famous Kona manta night snorkel last night. At one point we had six mantas in our sight. The plankton was pretty dense in the cove and the mantas were definitely enjoying the plethora of food. We watched them glide over the scuba divers at the bottom, before swimming straight up under the snorkelers at the surface. These pictures of of the manta as it barrel rolled inches under our board. Our underwater lights lit up the white underbelly of the 8+ft coastal manta. The black spots and splotches on the belly are how we identify individual mantas. 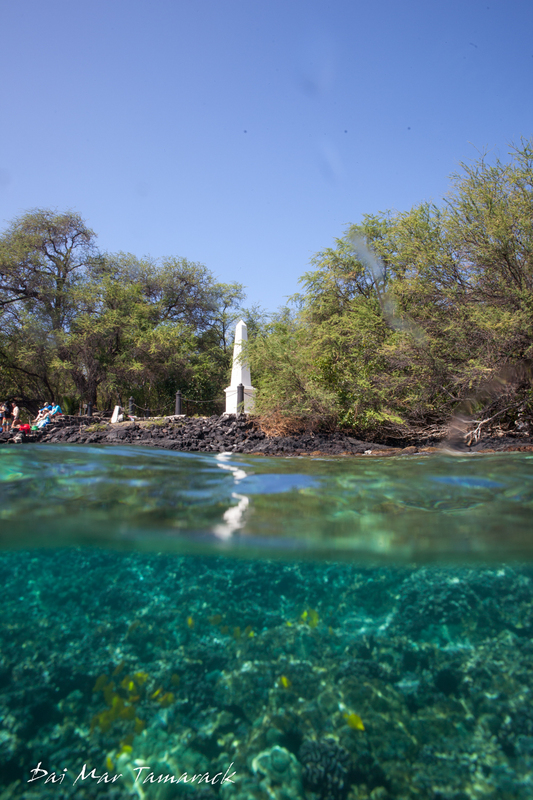 Over a hundred have been identified at this spot alone on the Big Island. It is always a good time when you have to remind your snorkelers to lift up their feet so they don't accidentally kick a manta ray. Here is hoping that they are back for good. 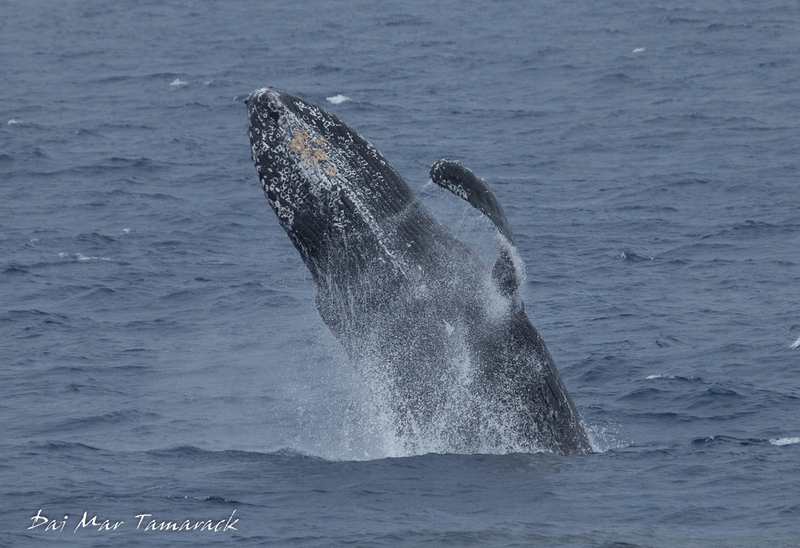 The group this week has seen bow riding dolphins, an underwater ballet of manta rays, and swimming sea turtles…but the wildlife highlight of the week may have been the amazing humpback whales. 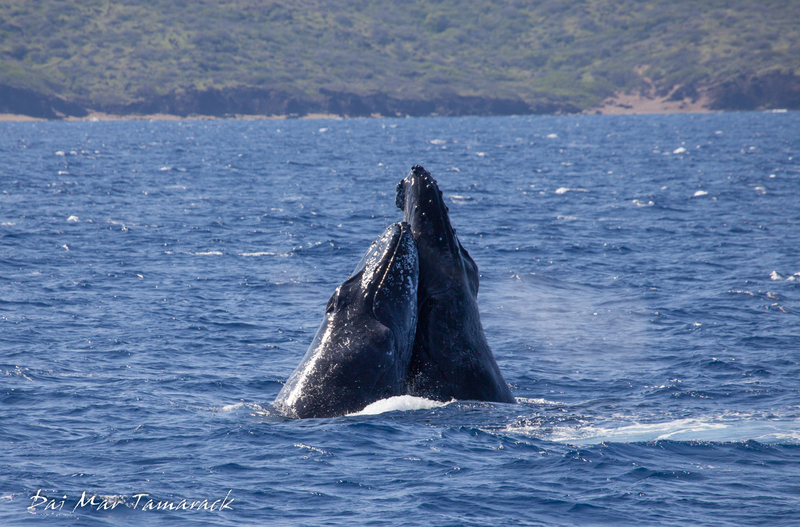 February Hawaii is humpback whale central. 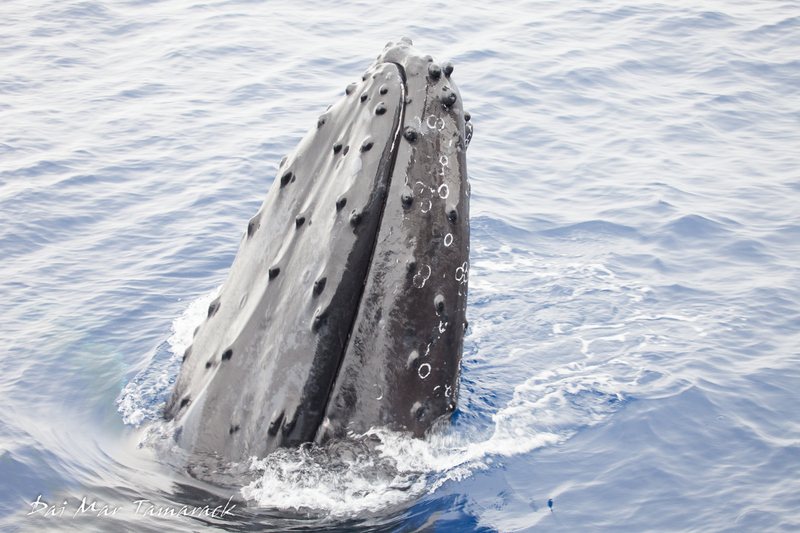 Nearly 60% of the 23,000 North Pacific Humpback Whales are estimated to travel here to the Hawaiian islands during the winter. 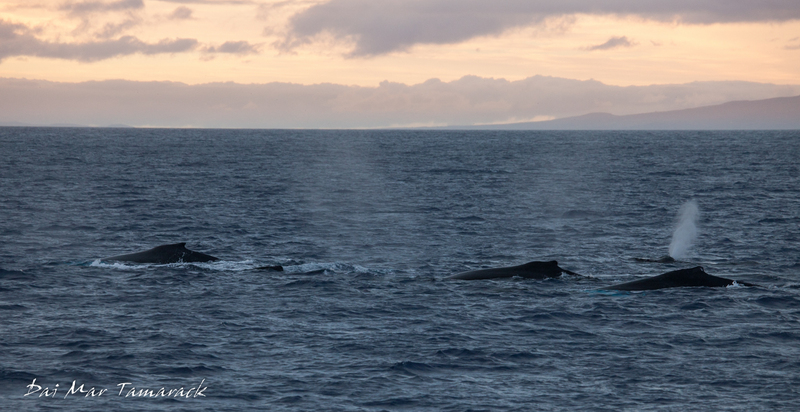 And while each individual whale may only stay a month or two, the most overlapping are here right now. 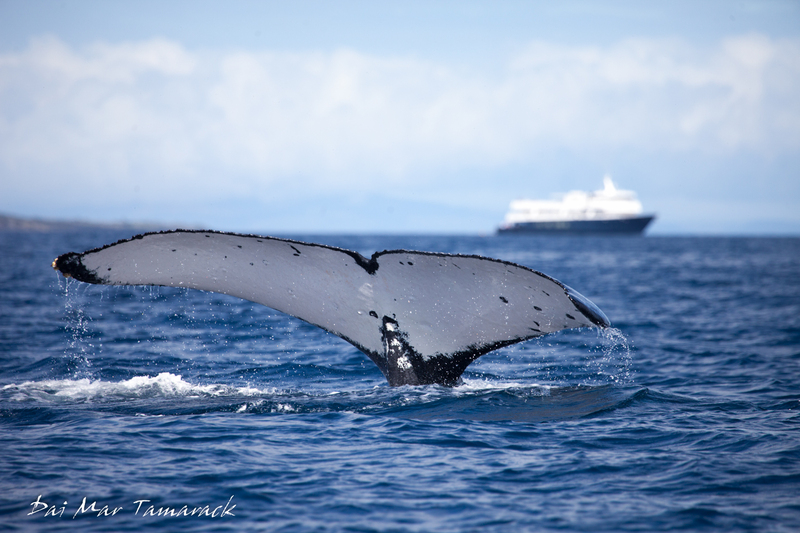 The guests saw whales from the hospitality suite on Molokai, and the sightings just never stopped from there. I told the guests to look for the 3 holy grails of whale watching here in Hawaii… a breaching whale, a brand new baby whale, and a competition pod. Breaching means the whale is launching its 80,000lbs body out of the water. Babies are born right here in the near shore waters and are about the size of a small pickup truck. They do look pretty adorable next to mom though who happens to be about the size of a city schoolbus. 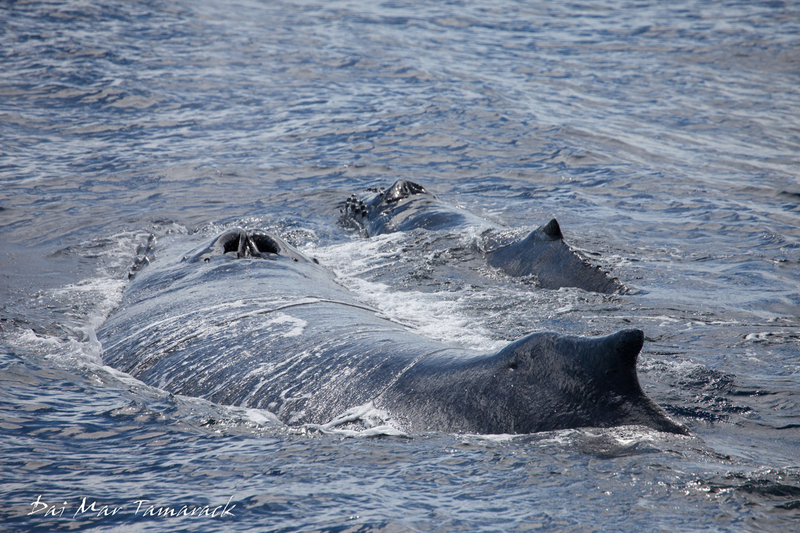 And competition pods entail multiple male whales fighting over one female. We think this leads to her picking a mate although they have kept the act of mating a secret up to this point so we can’t say for sure. All I know is that watching these behemoths bash into each other and jockey for position is something to behold. 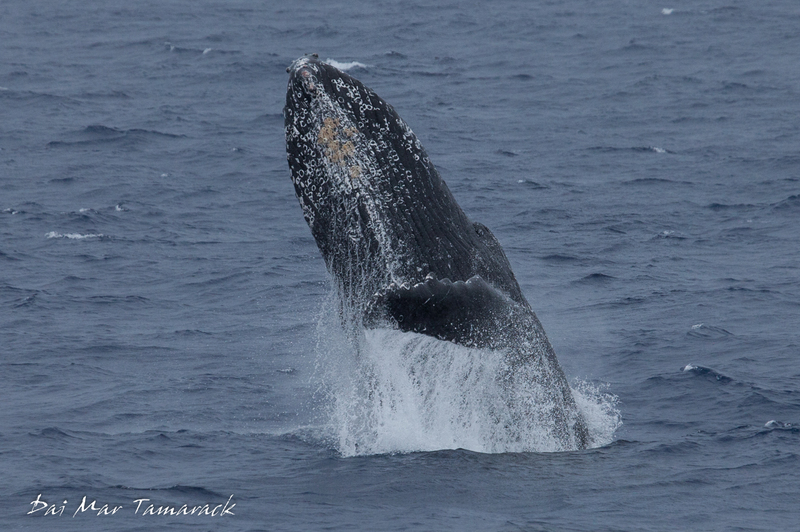 We got all the highlights this week including being able to hear the whales underwater with our hydrophone. 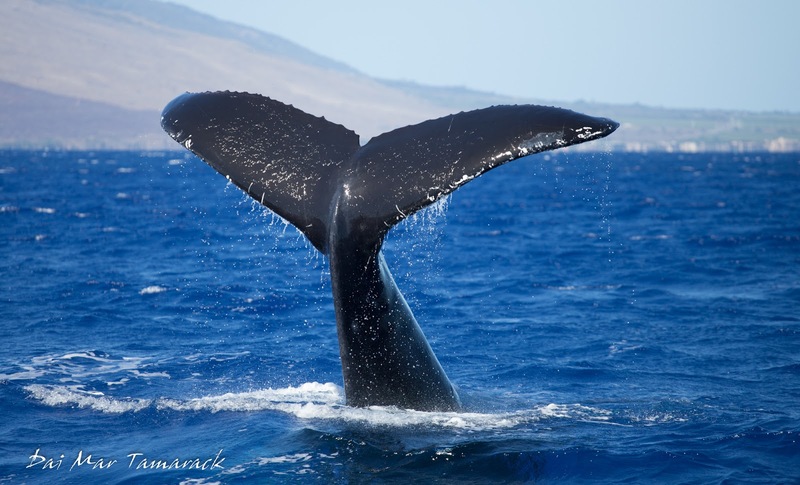 Here is to peak whale season in Maui!